Jack’s former wife and their two children had to empty Jack’s house. I remember doing this a few times with the home’s of family members who died. It felt very sad. The idea, that if I didn’t take something home, it would end up on the streets, was not a pleasant one. I am usually only interested in information: writings, photo’s, documents, etcetera. In my family there was rarely anything worth preserving. Jack’s wife asked I was interested in a box with cassette tapes. And of course I said yes. She brought the box last week, but in stead of one box it were four large boxes with tapes (at least 500), zines (all made by me, and at least 100) and CDr’s. Jack had a large record and CD collection, but I only got the CDr’s that he burned himself, mainly with mp3’s that he downloaded. I guess it are 150 CD’s, and very little with music that I like. Often there are no inlays with the CDr’s. Among the CDr’s was also a substantial part that came from me. And there is also was a small box with cassette tapes that I gave to Jack. I have no idea what to do with all this. 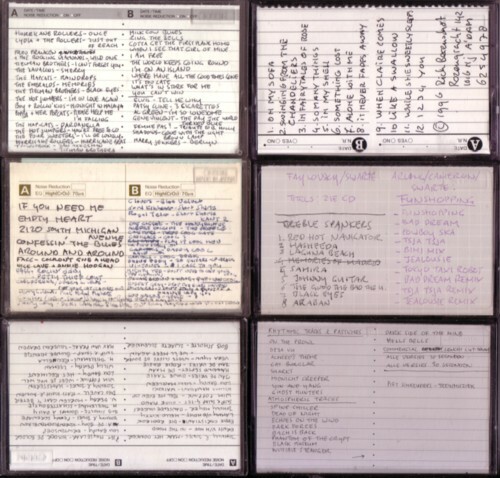 In the cassette days, Jack recorded a lot from friends and also from radio; I will sort it all out one of these days. It is interesting to see how much love and effort was put into these cassettes: many of them have beautiful tiny hand lettered labels. While most of the CDr’s only have a lousy jpg print as a cover and no info at all. Now, with the Internet and mp3’s, much of all the love and time that has been put in recording cassette tapes turn out to be pretty much wasted. Well, it was fun, of course! 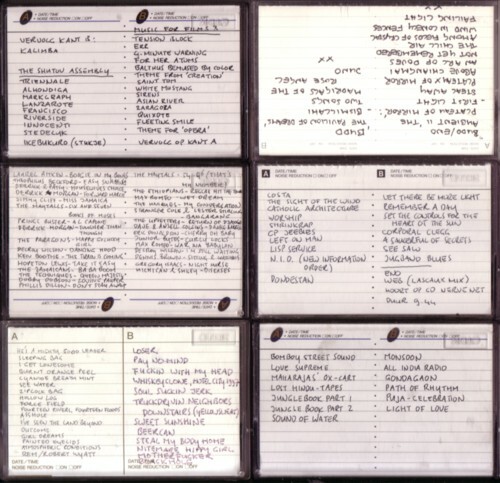 About half of the tapes contain complete LP’s. But not much with music that has my interest. The Beatles, Syd Barrett, Btrian Eno, Lou Reed, Radiohead, Iggy Pop, etectera. For now it seems that the only tapes that I will keep, are the compilation tapes that Jack made, either for himself or for friends. 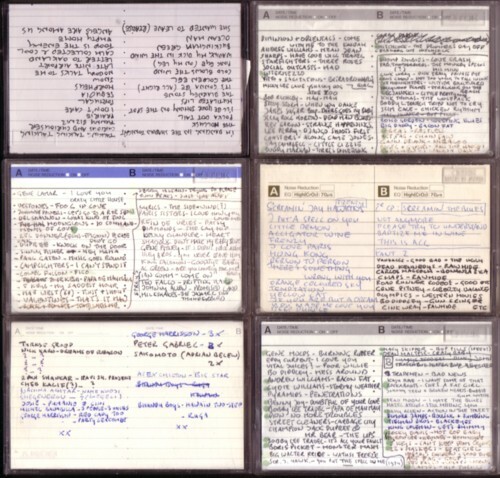 I listen to (parts of) the cassettes, and that causes flood waves of thoughts, memories and ideas. (Un)fortunately I don’t have the time to write it all down. In the early seventies psychedelic bands all had these kind of drum solo’s on their repertoire, and I think it is a good idea to create a CD compilation series with only the drum solo’s. Hi, Jack and I we very good friends for approx 30 years. Although Jack recorded a lot music for me in the past I’m very interesed, in the tapes if you have no destination for it.